As some of you know, we decided to leave cold and dark Finland for a month behind and enjoy warm and sunny Bali instead for the month of January (YEEEIIIII). So, we were really looking forward to over 24 hours of traveling. Well no, but you gotta do what you gotta do. Our trip started smoothly and our first stop was in Frankfurt. In Frankfurt, we still had time for a coffee and nourishing our internet addiction before the long-haul flight to Singapore without internet. Boarding started a bit delayed, but nothing to worry about. But once everybody was on the plane, we didn’t leave. There were different announcements with different reasons for further delays and I don’t remember most of them anymore. 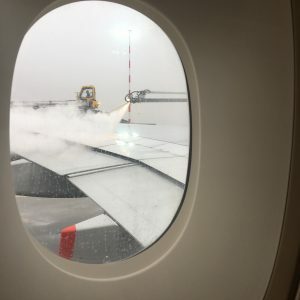 The last was that we’ll have to wait at least 45 min for the de-icing (WTF???). We were getting a bit nervous as we only had 1 1/2 hours time in Singapore to catch our next flight. We ask the staff, but got a pretty generic answer, which sounded to me like putting us off: “We’ll check when we know the arrival time”. Finally, we took off. Our flight left 2 hours late. We arrived in Singapore about 1 1/2 hours later than scheduled. We missed our connecting flight. Before landing, they announced that Singapore Airline staff is waiting outside the plane for passengers with connecting planes with more information. We were sure that we had missed our next flight and were prepared to go to the transfer desk, get our flights changed and spend the next few hours waiting at Singapore airport. But we didn’t have to go to the transfer desk. We got our new boarding passes, right when getting out off the plane. Right when we got out of the airbridge, we heard someone shouting “Passengers traveling to Denpasar, Bali”. We walked towards that person. He asked for our names and gave us our new boarding passes. Boarding time in 1/2 hour. So, we hurried to our departure gate. We had to change terminals and if you have been to Singapore airport before, you know that it’s pretty big. While running through the airport, I tried to connect to the wifi – at least it’s free wifi – to let our AirBnB host know that we’re delayed as we had agreed on airport pick up with him. This was a bit hard as I lost the just established wifi connection when jumping into the pass to the next terminal. DARN. One challenge was to figure out our new arrival time. I managed in the end also thanks to our AirBnB host responding super fast. So, we arrived just one hour late in Bali. Our AirBnB host was waiting already at the airport for us. In the end, all went well, but the story doesn’t end here. Fast forward to six weeks later. We had come back to Finland two weeks earlier. I got an email from Supersaver’s. When I noticed it, I first got a bit annoyed because I thought it was a newsletter which I thought I had unsubscribed from. 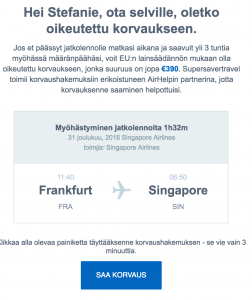 But when I read the subject line and opened the email, I had a very positive surprise: They asked me to check whether we’re eligible for compensation because of the delay of our flight from Frankfurt to Singapore. They informed us that we could get up to 390€ and a big button to claim the compensation. Apparently, it would only take 3 minutes. Luckily, we didn’t have to test that. You can only get compensation if you’re at least 3 hours late. There are some valuable lesson. What can we learn from designing better services from this experience? No matter how much effort you put into crafting amazing service experiences. Things will go wrong and upset your customers. Plan out for things going wrong. While it’s great to plan a smooth customer journey, also plan what to do if going wrong. As in our case, it doesn’t even have to be your fault. But that doesn’t matter for the customer. And positively surprising customers when things go wrong is one of the best ways to leave a lasting positive customer experience. What could Singapore Airlines have done better? While they did an excellent job in getting us as fast and smoothly to Denpasar Airport, they forgot that for their customers the journey doesn’t end in the airport. Our journey ended with putting down our backpack and sitting down on our terrace of our AirBnB in Ubud. 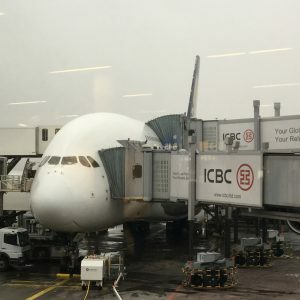 Here are some suggestions what Singapore Airline could have done to help us get smoothly not only to Denpasar Airport but to our AirBnB in Ubud. Give us our estimated time of arrival. That’s so basic. I’ve never understood why airlines don’t put the scheduled arrival time on the boarding pass. Typically, when traveling, you need to get our your reservation or other documents to check the arrival time again. Now, we couldn’t even do that. Singapore Airlines had wifi on the flight, but it was ridiculously expensive. Why not give free internet access towards the end of the flight, so that everybody can arrange the rest of their journey after arriving late. Bonus: With free internet, most passengers could have received their changed flight details and new boarding pass to their phone (via email or their app).